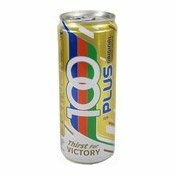 100 PLUS is specially formulated to hydrate and quickly replace fluids, energy and electrolytes lost during your active lifestyle, allowing you to perform at your peak. This product is produced from a facility that also handles milk, soybeans and sulphites. Store in a cool dry place, away from direct sunlight. Sediments are natural and do not affect quality. Ingredients: Carbonated Water, Sucrose, Glucose, Citric Acid (E330), Sodium Citrate, Sodium Chloride, Potassium Phosphate, Calcium Phosphate, Preservative (E211). Simply enter your details below and we will send you an e-mail when “100 PLUS Isotonic Drink (運動飲品)” is back in stock!